The Convention is a multi-purpose affair! First and foremost, it is a venue for updating our professional knowledge and obtaining CE credits. In addition to offering 7 CE credits in one day, the Convention offers the opportunity to get reacquainted with old friends and to make new ones, to share our professional experiences with each other, and to enjoy being “away from the office”! We should also add that without our membership, the Maryland Psychological Association and the Convention would not exist, and as always there will be an emphasis on bringing in new members and energizing the current membership to actively participate in our organization. We know from our own experiences that such participation can be one of the most gratifying activities in one’s career. Onsite registration opens 7:30AM the day of. This year we'll be offering thirteen workshop options, including two ethics and three cultural diversity workshops! Check out this year's list of workshops for details. Registration Deadline is 10/22/18. After that date registrations will be taken based on available space and only with a $35 late fee. MPAGS students have the opportunity to attend for free in exchange for helping with registration and monitoring duties. For information on this opportunity please email [email protected]. Otherwise, there is a 50% discount for students. There is small block of rooms available at the Marriott if you prefer to stay over the night before the convention and avoid morning traffic. The rate is $199.00 plus tax. Please be sure to ask for the "MPA" group code. This block/rate will be available until 10/15/18 . Marriott's number is 410-859-8300. Book your hotel online. Please see the Registration Details page for deadlines, cancellation policies, special needs, and requirements for successful completion in order to obtain CE. 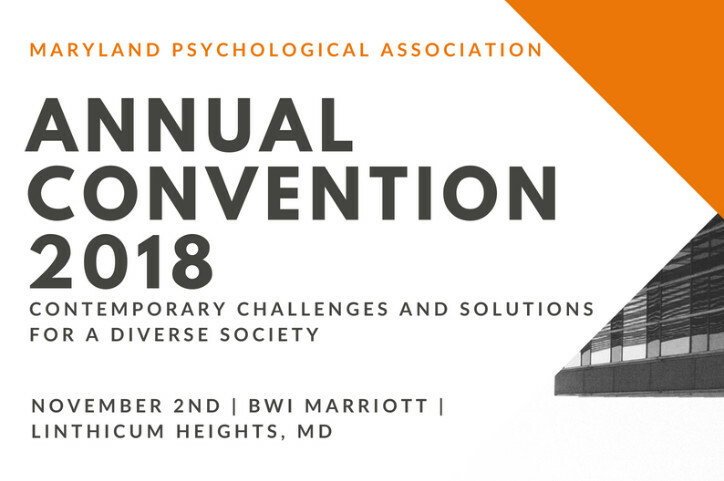 This is a great once-a-year opportunity to meet in person with over 250 Maryland psychologists and other mental health professionals to keep them apprised of your products and services and let them know of your support. In addition to being the Maryland State Association, our close proximity to DC, Virginia, Delaware and Pennsylvania allow our advertisers to reach a wide range of mental health professional in the Mid-Atlantic, via our advertising. We hope you will consider joining us this year. Please check out our Letter to our Vendors for full descriptions of opportunities available and fill out the Vendor Registration Form and return it to the MPA office via mail, email, or fax.